To celebrate the great astrophysical discoveries of our time, the DISCOVERY colour forecast evokes the vastness of space and inspired curiosity. In DISCOVERY, colour is often applied in ombre finishes to create a sense of weightlessness. This is complemented by bands and stripes that suggest energy and progress into an unpredictable future – an adventure of light pastels and dark hues. The 21st century has seen mankind step into the unknown. Physicists are discovering the possibilities of parallel universes and extra dimensions, and just recently, gravitational waves were observed around colliding black holes. The DISCOVERY colour forecast pays homage to our pioneering spirit by recreating the grandeur of the night sky and all its mysteries. Achieve a sense of depth by using Discovery’s night-sky inspired blues and purples, or use its cosmic pink for dramatic effect. 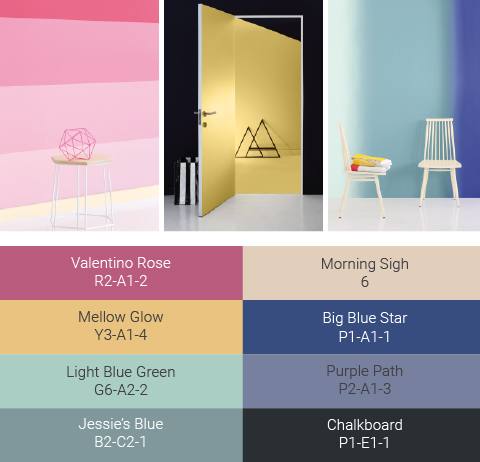 Colours such as Purple Path (P2-A1-3), Big Blue Star (P1-A1-1) and Valentino Rose (R2-A1-2) are the key to this theme’s atmospheric feeling. But don’t forget techniques such as ombre painting to mimic the play of light and shadow.